Freestanding walls are the perfect compromise solution for city dwellers whose strict building codes don’t allow for the building of a full temporary wall. Built with the look and sturdiness of a typical wall, a freestanding wall ends before hitting the ceiling, leaving a gap that many buildings will allow, while still providing privacy and separation. With the addition of a freestanding wall, you can easily incorporate another room into your space with its own designated area. 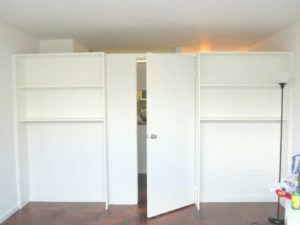 Freestanding walls can accommodate another roommate, a private nursery, a home office or a comfortable living space that is separate from the bedroom areas. To construct a freestanding wall, a certain amount of screws are required, but these are easily removed and leave minimal traces behind, ensuring that no harm is done to the existing building. Whatever the particulars of your building’s code, Temporary Walls NYC is scrupulous to stick to its regulations and will make sure to install your wall in a way that your building manager will allow. The nature of a freestanding wall is flexible, making it an easy choice that can be assembled in many places throughout your apartment. The installation process is quick and simple, ensuring that your space can be up and running in a timely manner. You would be amazed at how quickly you can go from thought to reality with the installation of a freestanding wall! Not only it is much faster than a typical renovation project, but a temporary freestanding wall is also much more cost-effective. Start your transformation today with a free consultation from Temporary Walls NYC!